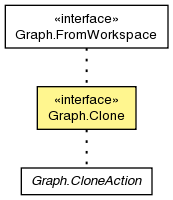 Nodes can be copied within the same workspace or to another workspace; cloned nodes must be copied from one workspace into another. Copied nodes always get new UUIDs; cloned nodes always maintain their UUIDs and hence must define the behavior that occurs if a node with the same UUID already exists in the new workspace. Nodes can be copied to a specific name under a specific parent, but can only be added as a new child node at the end of the new parent's children; nodes can be cloned to an exact location among the parent's children, replacing the existing node at that location.